(CNN) -- While Sen. Barack Obama says he'll visit Iraq and Afghanistan before the election, he's staying consistent with his plans to start withdrawing U.S. troops almost immediately should he become president. 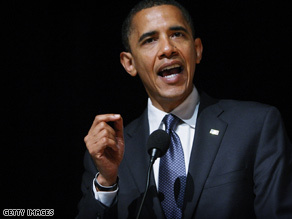 Sen. Barack Obama says he'll go to Iraq and Afghanistan before November. "One is to spur more action out of the Iraqis. ... But the second reason for withdrawal is the fact that we're spending $10 [billion] to $12 billion a month in Iraq," Obama said Monday while on a two-day swing through Michigan. "The people here in Flint, Michigan, who I'm going to be talking to, would like to see some of that investment made here at home." Obama also expressed concern that the Bush administration would rush to make some sort of status of forces agreement that would be binding to the next administration. The war in Iraq is a key issue for voters in the United States, and Obama and Sen. John McCain offer vastly different solutions for how to handle it. McCain does not think American troops should return to the United States until Iraqi forces are capable of maintaining a safe, democratic state. He has been a strong advocate of the "surge" -- the 2007 escalation of U.S. troops -- and says troops should stay in Iraq as long as needed. "I emphasized to him how encouraged I was by the reductions in violence in Iraq, but also insisted that it is important for us to begin the process of withdrawing U.S. troops, making clear that we have no interest in permanent bases in Iraq," Obama said. "I gave [Zebari] an assurance that should we be elected, an Obama administration will make sure that we continue with the progress that's been made in Iraq, that we won't act precipitously," he said. Obama said Zebari did not express concern about a withdrawal of American troops, saying, "He did emphasize his belief that we've made real progress and, I think, was eager to see political accommodations between the factions follow up in the wake of this progress." About the same time Obama was speaking to his traveling press corps, McCain told reporters at a press conference at his Arlington, Virginia, headquarters that Obama "is now is closing in on his 900th day since he visited Iraq." The Republican National Committee has a counter on its Web site that clocks the time since Obama's last visit to the country. "The whole debate in this campaign should be about whether we're going to allow that surge to continue to succeed or we're again going to do what Sen. Obama wanted to do, and that is to set a date for withdrawal long ago without giving the surge a chance to succeed," said McCain, again criticizing Obama for not meeting directly with Gen. David Petraeus, the top U.S. military commander in Iraq. "I don't know how you can draw conclusions such as Sen. Obama has without even sitting down and talking with our commander on the ground," he added. The senator from Arizona said they had a "very good discussion about the challenges that have been overcome and the challenges that lay ahead," and he said there is "no doubt" that the surge has succeeded. There have been recent improvements in Iraq, where there are more than 150,000 U.S. troops. The number of deaths of U.S. troops there was at a five-year low last month, and Zebari said Saturday that the country has the lowest level of violence in the past four years. "I do think that there was a sense among the Democratic Party that the war, and the failure of the war, was going to be a major election issue for them that they could use against the Republicans," Pollack said Sunday on CNN. "And so, when you had two Democrats coming back and saying, 'Look, there actually is progress there. This thing is not completely lost, and we ought to give it some more time' -- which is effectively all we were saying -- I think that this was a bombshell, because it wasn't what people had heard before." O'Hanlon said Sunday that they've seen continued progress, especially in the capabilities of the Iraqi security forces. He said Democrats are not rethinking their Iraq policy because, for many of them, "this is the symbol of the Bush administration's failed foreign policy." "This became the symbol of Bush administration arrogance and unilateralism. And then, for four years it went badly. So, given that backdrop, it's pretty hard for Democrats to come around to the idea that perhaps, by Bush finally letting professionals run this war instead of ideologues, that we have begun to rescue this situation. I think that's the simplest interpretation." CNN's Alexander Marquardt and Chris Welch contributed to this report.